SIR is a leading company in high-tech industrial robotics, capable of guaranteeing absolute quality and control together with extreme flexibility. Although its size is still the same, our planet seems to us to be getting smaller and smaller. The number of interconnections between people is growing exponentially, the global economy requires the large-scale transportation of people and goods, and the demand for satellite infrastructures is becoming more and more pressing. During the last few years, these factors have led to a rapid rise in air and aerospace traffic, and there is no sign of this trend slowing down. Therefore, demand is growing from companies in the sector for the production of an ever-increasing number of state-of-the-art components and aircrafts, to satisfy the needs of a rapidly changing society. What’s more, the growth of competition in the sector is forcing firms to review their production processes to improve systems’ efficiency and cut times and costs, while guaranteeing products that meet the high quality standards required. 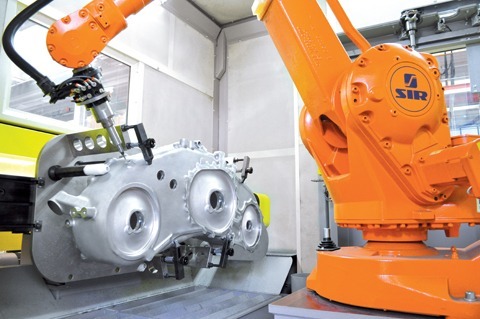 As we all know, industrial robotics is now widespread in all manufacturing sectors, used in virtually every phase of the production process, from automated, flexible assembly to the machining of components, and from quality control to final palletisation. However, its use has not previously been so common in the aerospace industry because of this sector’s distinctive features: unlike other industrial products, aerospace components are manufactured in small lots, even down to a handful of units for the largest-sized articles such as gear housings, wing spars or aircraft tank mounts. Moreover, the machining processes are rather complex and may take hours for a single component: in a context of this kind, automatic mass production is usually not economically viable. Another characteristic of this industry is the need to achieve exceptionally high precision and quality levels, above those of conventional sectors, to meet the safety and reliability criteria essential for the use of planes and helicopters. The procedures for checking dimensional tolerances and the conformity of machined surfaces are also normally carried out by human operatives. 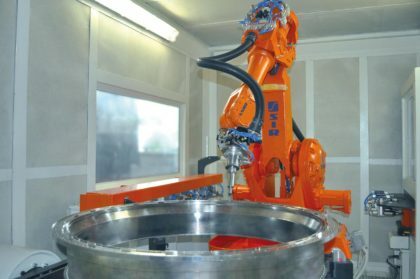 During the last few years, the recent developments in robotics technology and its related tools, such as artificial vision and virtual prototyping, have allowed the problems associated to the above factors to be overcome, and the aerospace industry can now be offered new prospects for production based on flexibility and absolute quality. SIR Soluzioni Industriali Robotizzate of Modena, pioneer of industrial robotics in Italy and one of the world’s first robotic system integrators, is now able to draw on the experience gained in more than 25 years in all manufacturing sectors, and in all types of use of articulated and Cartesian manipulators, to offer customised, state-of-the-art solutions for combining the precision and flexibility of skilled craftsmanship with modern automation. ROBOTIC AUTOMATION OF THE VERY HIGHEST PRECISION. 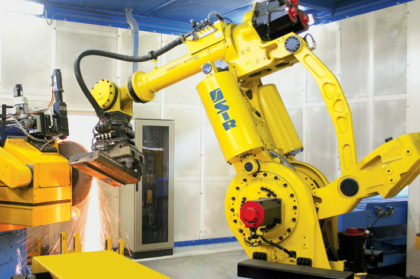 In the production of small-sized components such as the stator blades of turboprop and jet engines, lots are large enough to allow a traditional approach to robot programming, although the need to comply with extremely tight machining tolerances means that high-tech solutions are still essential. SIR has succeeded in transferring to this sector the technical expertise and capabilities acquired in high-performance mechanics for the sports and racing car industry. The convergence and combination of a variety of integrated technical solutions has enabled SIR to produce stator blade trimming plants with an amazing level of precision. Robotic manipulation is optimised using contact feelers and probes to correct the grip and obtain extremely reliable, reproducible piece location. The machining process is performed by spindles with high-sensitivity multi-directional compensation, fitted on the robot wrist or in fixed stations as appropriate, capable of controlling the force applied to the material from very high values down to a few tenths of a bar. Each system is complete with a varied array of specialist tools for optimal performance of every processing phase. 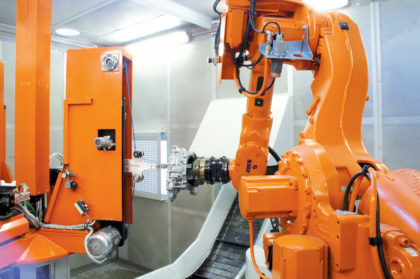 Another solution adopted to achieve results of the very highest quality is automatic tool wear monitoring: at each cycle, the robot uses a special laser scanner to assess the tool’s level of wear and automatically corrects its program to adapt it to the results found, while also alerting the operator to tools which require replacement. Worn tools can be changed by hand in complete safety even during the machining cycle, so no production stoppages are necessary. The machining of large components with small lot sizes is another matter. We are talking here, for example, about gearboxes and housings, missile supports and all the complex components which require process machining operations such as profile trimming, surface grinding or the flaring of fixing screw holes. 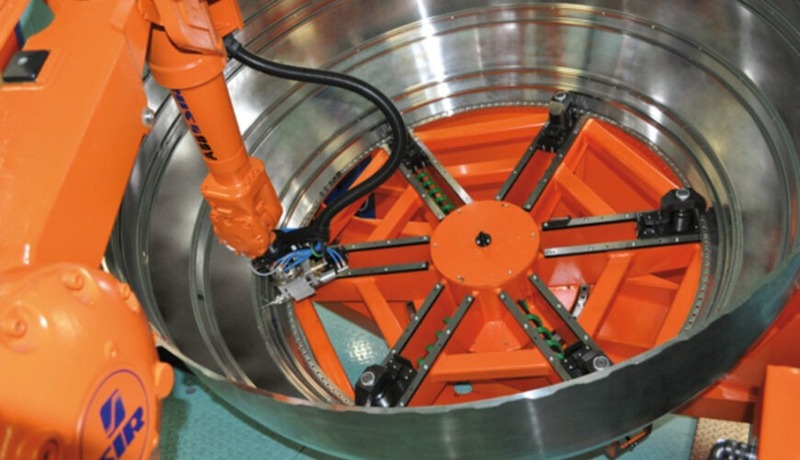 In these cases, the tool magazine at the robot’s disposal is even larger, comprising a vast assortment of discs, abrasive brushes and flaring tools. The higher single piece costs make absolute precision and the total absence of machining errors even more indispensable. One or more additional axes are therefore added to the manipulation process, allowing the piece to rotate and swing during the machining cycle so that the robot can perform all procedures with the optimal angles and positions. The entire system is installed inside a soundproofing protective booth for a safe, pleasant working environment. For high-strength aluminium alloy components, special safety measures such as anti-explosion extraction systems and filters are required. SIR’s solutions guarantee achievement of the precision and quality characteristics required from machining processes, thus justifying the use of robotics even for the manufacturing of large pieces with small production lots. In these cases, conventional robot programming is inappropriate because it requires preparation times and machine stoppages that would be unacceptable for such small production lots. It therefore becomes necessary to use off-line programming systems, which speed up programming times considerably and reduce the machine downtime to a bare minimum. SIR supplies the customer with a complete, guided simulation environment for generating even complex working paths starting from the CAD model of the piece for machining. Even if the virtual model is not available, manual digitisation can still be used to acquire a 3D image of the piece. So the machining path, including the tool’s angle, its geometrical characteristics, or the approach movements, can be set in detail while comfortably seated in front of one’s own computer. If changes have to be made, they can quickly be applied to all or some of the process with no need to stop operation of the system. 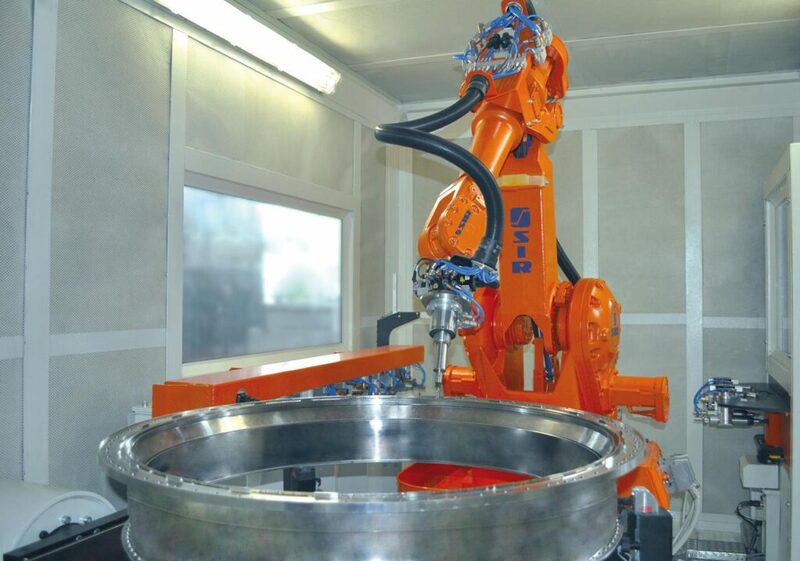 The availability of systems that can guide the robot to the piece picking or placing locations is also particularly important in this type of plant, since extremely high precision gripping is required to ensure the success of the subsequent machining operation. Therefore as complexity increases, artificial vision systems become another fundamental factor for a successful process strategy: in large objects, traditional synchronisation systems may be insufficient for high-precision positioning. Thanks to vision camera systems on board the articulated robot, SIR can correct and perfect its movements during the actual working cycle. What’s more, the same technologies can be used to perform end-of-processing quality controls, to check for defects. So the types of robotic system SIR offers today are very different from those traditionally found in large production plants. The robot no longer merely performs repetitive, mechanical actions; it becomes an intelligent operative, reproducing the manual skills of a real, highly skilled craftsman, which it has learnt from man himself. However, bringing together all the competences needed to achieve this result is no easy matter. The automation of products of this kind requires technological partners capable of delivering quality, continuity and ideas, especially in the aerospace industry, where nothing can be improvised or left to chance. In this sector there is no room for slapdash solutions or automations that are “there or thereabouts”: design becomes a fundamental point, to be undertaken in close cooperation with the customer, always seeking innovative solutions and making good use of the invaluable know-how accumulated over decades on the job. Over the years, SIR has made these characteristics one of its trademarks, and its input can provide the all-important competitive advantage in helping companies with high-tech products to overcome these difficult, challenging times.